The MBTA Rider Oversight Committee, volunteers who ­advise the T on customer service issues, will use the survey results to recommend possible late-night service strategies in the next few months. Reid Sprite, cochairman of the committee, said he and other members will identify which routes would be most popular with the after-hours crowd. “We’re figuring out whether the current daytime routes meet nighttime needs,” Sprite said. These are good signs from a survey, and also from the ROC. There is no reason why night time service demand would necessarily match day time service demand. In many comparable cities, night time service is provided in a significantly different manner from normal service. For example, during the day, the MBTA's radial network is used heavily to bring people to and from the downtown Boston CBD. But as anyone who has walked there after dark knows, much of that same area is a ghost town at night. Many of the subway routes are not paralleled by roads and therefore are very difficult to efficiently replicate with a bus. 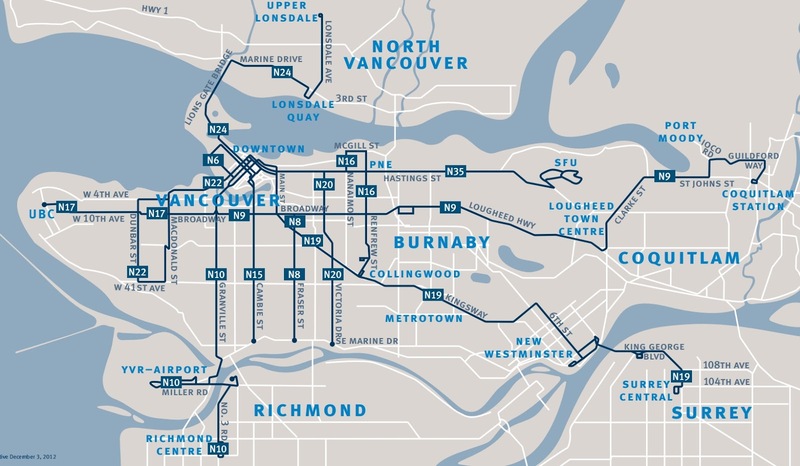 Instead of going station-to-station, a similar, but more efficient bus route should be identified. The most important, and yet most expensive, aspect of service provision is frequency. That becomes completely unaffordable when the volumes are much lower -- such as at night. In order to save money, the agency may choose to operate routes at lower frequency, but this could make transfers terribly difficult. Nobody wants to get stuck watching the bus you need leave too soon, facing a 30 minute wait at night. The answer is to take a page from suburban transit services and use timed transfer points: all the intersecting buses come together and exchange passengers, and then all leave simultaneously to their next destination. Some additional operating cost can be made up with a fare surcharge. But only to a point, as you don't want to discourage ridership. When the MBTA ran night owl service in the past, it was discontinued due to cost. But it's not clear whether they could have saved money by adopting some common sense changes, and attracted more riders through better advertisement (not to mention the real-time tracking which is now available). And even for the cost that remains, I believe that even one drunken driving death avoided each year would be enough to make it all worthwhile. As for running the subway trains later, let's get that out of the way. It is possible to run trains 24/7 even on a two track system like we have. Just look at the Chicago "L" which operates the Red and Blue lines at all hours even though they run through two track tunnels inside the "Loop". Heck, even in San Juan I witnessed seamless single-tracking of a portion of their elevated Tren Urbano for day-time maintenance purposes. And the excuse that the T gives is downright lame: "it's the oldest subway in America." No, it isn't. Only the portion of the Green Line between Scollay Square and Boylston can lay claim to being built in 1897 (plus the remainder of the Tremont Street tunnel). The rest was built out in stages over the course of the 20th century, and is "technically younger" than a large part of the NYC subway. Plus, everything gets renovated and refurbished every so often, or would if not for deferred maintenance. But all of that is irrelevant. The real question should be this -- which is more efficient and effective: operating the subway later, or replacement Night Owl bus service? And I believe that the answer is the latter, for now. The capacity and frequency needs seem suited for bus service. It's easier to implement timed transfer pulses when all the vehicles can come together at the same place (the T does do a timed transfer between subways and buses currently, but it requires more personnel). Later subway service would probably require changes to maintenance schedules and some physical alterations, which may be a good idea anyway, but will have to wait until there's funding. And I think the most compelling argument for Night Owl buses is simply this: that's how other cities do it, including some big names like Paris and London, as well as more comparably-sized cities like San Francisco and Montreal. 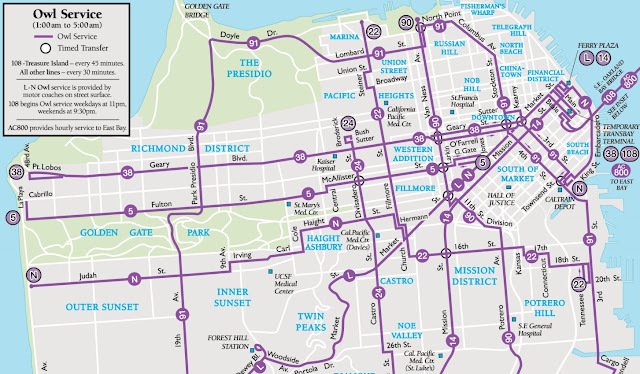 San Francisco MUNI has a good clear map which is largely based on their day-time routes, but simplified and consolidated. Note in particular the "L" which has to go over the Twin Peaks mountain in order to replicate the trolley service which runs in a tunnel. And also the abundance of timed transfer "circles". Montreal recently expanded their night bus vehicle hours by 73%. The black dots are subway stations; notice how little prominence they receive, except for those used as transfer points. 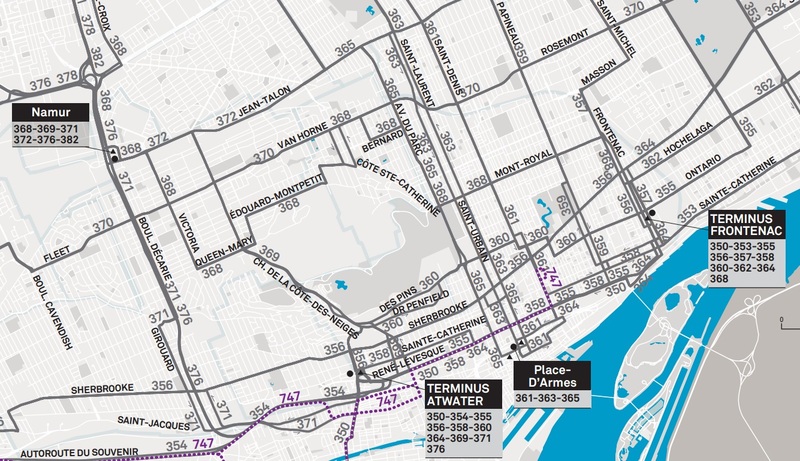 The STM actually ends normal service earlier than the MBTA, because it can count on night buses. The "747" route goes to the Airport. Vancouver (Canada) TransLink sends out pulses of night buses from downtown until 3 a.m.
Austin (Texas) Capital Metro operates a set of night buses until 3 a.m., focused around 6th Street, of course. 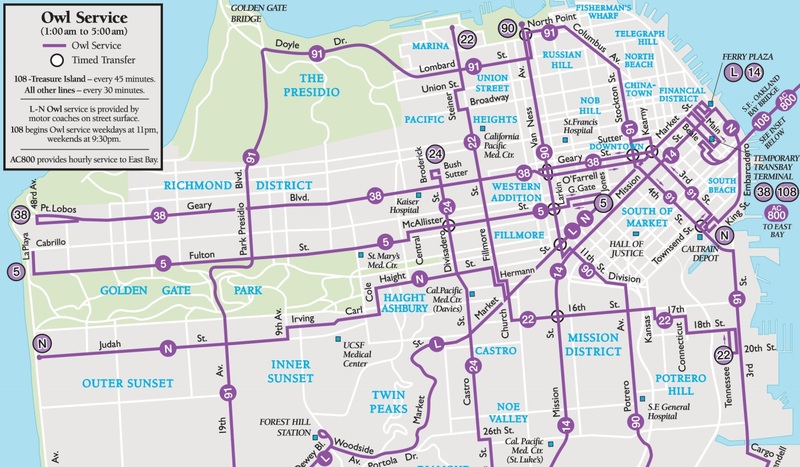 The night bus networks are simpler than the day-time networks, but they exploit the riders' existing "transit geography" knowledge to put together sensible routes. They rely on timed transfers or pulses. They are focused on serving areas of high night time demand, and the agencies publish clear maps and generally try to do a good job of disseminating information and posting signs to help guide users. If the MBTA decides to take another shot at providing night time service, and I think they should, then they ought to take some cues from other agencies who already operate such networks successfully. Personally, I think the MBTA should address their current issues first, before trying to expand their service. Their current issues are largely ones that the Legislature must address, e.g. the Forward Funding debacle. It's out of the MBTA's hands. The Governor's transportation plan does include late-night service as a potential feature, so it's back in the conversation even from that end. And finally, we're capable of talking and thinking about more than one thing at a time. Even if the legislature does manage to come up with a good idea regarding the MBTA for once in its existence, that only removes some of the money woes. It doesn't resolve the problems of overcrowded, leapfrogging or chronically late buses and trains and they still have a backlog of projects and maintainence. I'm sure no one wants to be stuck on a disabled train between Arlington and Boylston at 3 am anymore than they want it at 9 am. Yes, we are capable of talking and thinking about more than one thing at a time, but I think that improved regular service is more important than new service. Especially since a lot of the demand seems to be because of Boston's traditional inferiority complex regarding New York. I think it's unhealthy to plan city services based on what they do in another city. Serious question: did you read what I wrote in this article? Yes, I was just making the point that people won't want to be stuck in a disabled train at 3 am. Most people I know seem to think "Late night T= late night trains" rather than a late bus. I realize, but the big argument I made in the article is that late night bus service is the answer, and I pushed back against late night train service. A lot of people that I interact with think that "T=trains" regardless. Sometimes I have to remind them that there are buses too.